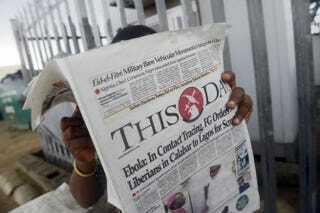 A man reads a newspaper with a headline on July 27, 2014, announcing government efforts in Lagos, Nigeria, to screen for Ebola. Health authorities worked quickly Saturday to contain the potential spread of the deadly Ebola after a man reportedly stricken with the virus boarded a plane from Liberia to Nigeria, the Associated Press reports. The incident raises fears that the man could have spread the highly contagious disease to other travelers aboard the plane, the report says. Further, “an outbreak in Lagos, [Nigeria], Africa’s megacity where many live in cramped conditions, could be a major disaster,” the AP writes. With 21 million people, Lagos is Africa’s largest city and a bustling commericial hub. “Lagos is completely different from other cities because we’re talking about millions of people,” Plan International’s Disaster Response and Preparedness Head, Dr. Unni Krishnan said, according to AP. So far, health workers have identified the disease only in Africa, where it has caused an estimated 672 deaths “across a wide swath of West Africa,” AP writes. The report describes the disease as “highly contagious and kills more than 70 percent of people infected.” Symptoms are similar to malaria and typhoid, the report says. Concern about the spread of the disease via air travel was raised Tuesday after Patrick Sawyer, a consultant for the Liberian Ministry of Finance, was quarantined by health authorities in Nigeria, who suspected that he might be infected, AP writes. Although he displayed no symptoms aboard the plane, he was vomiting and had diarrhea by the time he arrived in Nigeria, the report says. So far, no other cases have been recorded, the report says, but about 50 other passengers are “being monitored for signs of Ebola but are not being kept in isolation, said an employee at Nigeria’s Ministry of Health, who insisted on anonymity because he was not authorized to speak to the press,” AP writes. And Dr. Lance Plyler, who heads Ebola medical efforts in Liberia for aid organization Samaritan’s Purse, told AP that medical screenings for the disease could help slow the spread of the disease, but said there is no guarantee that it will not travel by plane.